Welcome to Victory is Life! This year marks the 25th Anniversary of the launch of Deep Space Nine, and the team for Star Trek Online couldn’t wait to mark the occasion with our fourth full expansion: Victory is Life. The only way we could see to top our previous expansions was to not only introduce a brand new player faction in the Jem’Hadar, but also throw in a level cap increase from 60 to 65! Starting today, Captains in Star Trek Online will have the opportunity to create a brand new captain in their own Jem’Hadar faction. All Jem’Hadar captains will be as formidable right out of space dock as their namesakes, as they will be leveled up to 60 with a fully equipped ship, a fully geared crew, and a variety of completed Reputations, Specialization trees, and R&D progress. As a fresh captain you will have all the tools you need at your disposal to dive in and play Star Trek Online right at end game, all 100% for free. On top of the ability to create a brand new Jem’Hadar captain that starts at end game, we’re delivering the first level cap increase in nearly four years. We have a variety of exciting content available for everyone. We’ll have 7 brand new episodes that will take you through an incredible story full of twists and reveals, a new queue, “Swarm,” that shows the devastating impact of the Hur’q, the all new Gamma Quadrant Sector Space Battlezone that takes the concept of a battlezone and increases the scope to include literally everyone playing in the Quadrant, and the Gamma Task Force Reputation that will give you everything you need to take the fight to the Hur’q. Players that create their Jem’Hadar captains during the first six weeks of launch will also be able to participate in the new Jem’Hadar recruitment system. This system provides challenges for captains to complete that will provide bonus personal and account wide rewards. This collection of fantastic content will put you in the boots of a Jem’Hadar, and give you a true Deep Space Nine experience. The story that drives Victory is Life dives deep into the history of the Hur’q, the Dominion, and is rich with classic DS9 moments. To tell such an incredible tale we needed an incredible cast, and we were able to feature nearly the entire main cast of Deep Space Nine. 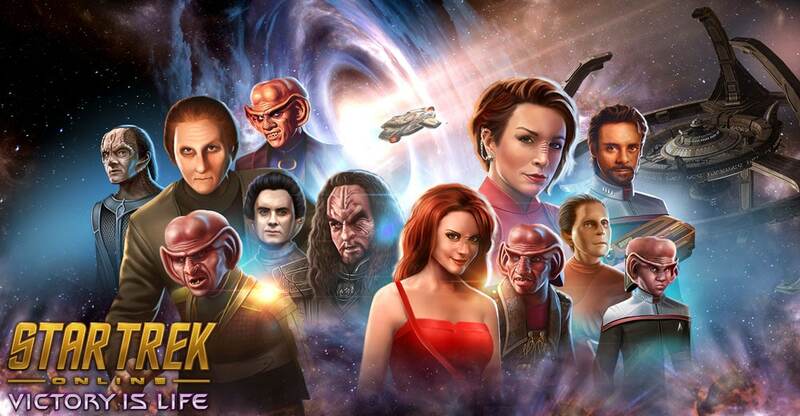 We have Rene Auberjonois returning as Odo, Nana Visitor as Kira Nerys, Alexander Siddig as Dr. Julian Bashir, Andrew Robinson as Elim Garak, Armin Shimerman as Quark, Aron Eisenberg as Nog, Jeffrey Combs as Weyoun and Brunt, J.G. Hertzler as Martok, Chase Masterson as Leeta, Max Grodenchik as Rom, Salome Jens as the Female Changeling, and Bumper Robinson as Dukan’Rex. All in all, this is the largest cast we’ve ever assembled for an expansion and with a story you have to play to believe. This is an expansion that the team has been wanting to build since the launch of Star Trek Online, and we’re so proud to be able to deliver it during the 25th Anniversary celebration. Victory is Life brings intrigue, excitement, and amazing characters into Star Trek Online, and I can’t wait to see everyone in game!